the AMD 939 pin CPU socket also a so-called ASRock Future CPU Port (yellow slot). can upgrade the board for Socket AM2 within a few minutes! 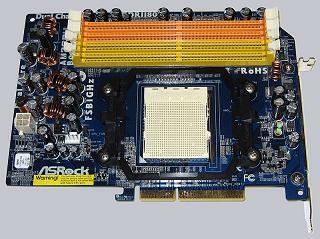 DDR II memory modules, which are set directly on this board. is delivered in this small box:"